Spring may be in full bloom, but the taste of Fall still lingers. Although months have gone by, my dining experience at Terrapin during Virginia Beach Restaurant week is a memorable one. As a self proclaimed supporter of the slow food movement, with a Chef (Rodney Einhorn) who has cooked at the James Beard house, Terrapin has been high up on my 'must visit' list for a while, and my senseless reason for not visiting...fine dining is intimidating. I may be showing my youth, but my mind goes to an episode of Spongebob, where the Krusty Krab was transformed from a burger shop to an upscale restaurant. Spongebob (as a waiter) was instructed to forget everything except fine dining and breathing, and in doing so, forgets his own name and self-destructs. Its extreme, but the atmosphere of some fine dining establishments can seem cold and robotic. Spoiler Alert, Terrapin isn't one of them. From sitting down and having a napkin placed across my lap, being provided with drink options that would pair well with my meal, and greeted by the kitchen staff while leaving, the staff are taking service to the next level. 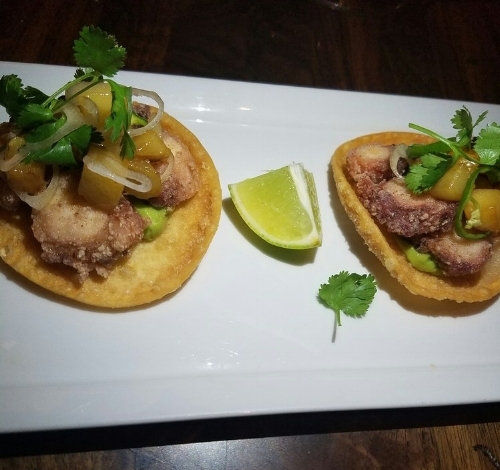 My first course was Octopus Tostadas with avocado puree, jalapeno, shaved red onion, and charred apple. I was concerned about the presence of jalapenos because I'm not a fan of heat, but to my delight I could barely taste it (which may have been a negative for others). This shouldn't be compared to eating calamari; the meat was soft and fried just enough without being greasy or chewy, and the apple and onions provided a good texture against the avocado. 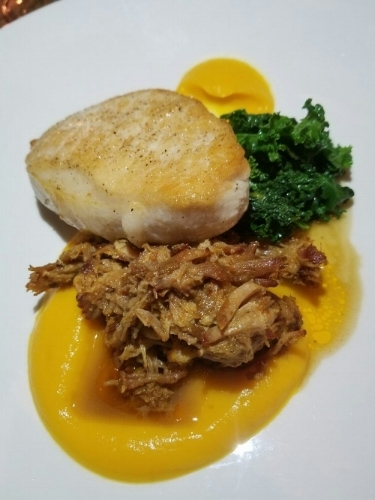 My second course was the Pork Duo with Kale and butternut squash puree. While ordering this, I was made aware that you could get pork cooked to order; knowledge is power you guys! The meat was tender with the perfect amount of seasoning that didn't compete with the other parts of the dish, and the BBQ had the smokiness that you find from cooking it on a pit. The Kale at first glance appeared to be blanched and under-seasoned, but they excelled in keeping the integrity of the kale without feeling like you're eating rabbit food. The butternut squash puree was creamy and balanced out the other textures, a bowl of that would've been perfect. 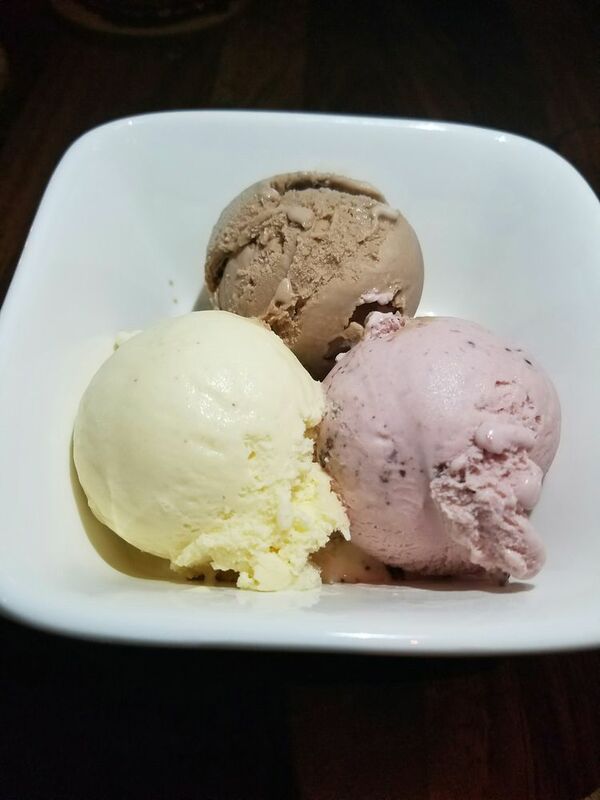 My third course was the Ice Cream Trio. While I appreciate that they make it in house, the flavors were not memorable, and the taste did not rank higher than homemade ice cream that I've had at other places. I was not disappointed, but in comparison to my other 2 courses, I wasn't craving more. The overall experience here was unbelievable, and I feel silly that I let the fear of not belonging or a stuffy atmosphere keep me from visiting. Thank you Terrapin for proving me wrong. Hi, I'm Kim! 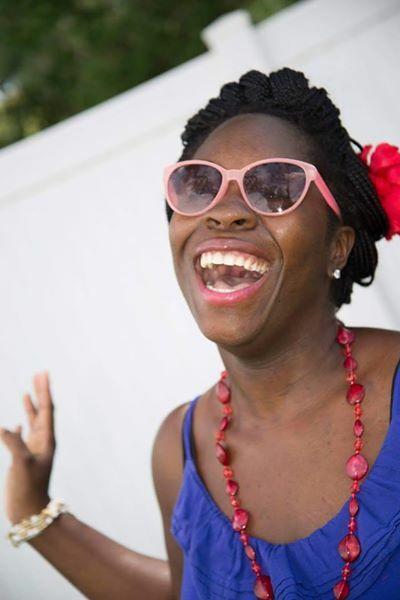 So Full Zest is a place where you can read about my love of food, weight loss & spontaneous adventures!